While the Trump administration's threat to slap tariffs on Chinese imports has heightened fears of retaliation from Beijing, it has only mildly rattled markets enjoying a multi-year rally as global economic growth picks up. The finance ministers of the 20 big world powers meet for a key G20 summit on Monday. Currency managers are keen to see whether diplomacy breaks out or disagreements deepen between the U.S. and others in the wake of U.S. President Donald Trump's announcement on imposing tariffs on steel and aluminium imports. Currencies don't like trade spats. President Obama's relatively narrow tariffs on Chinese steel in May 2016 saw the dollar index fall more than 2 percent over a month. Against the yuan, it rose 2 percent. Similarly, within three months of President George Bush's March 2002 tariffs on EU steel imports, the dollar declined 6 percent. 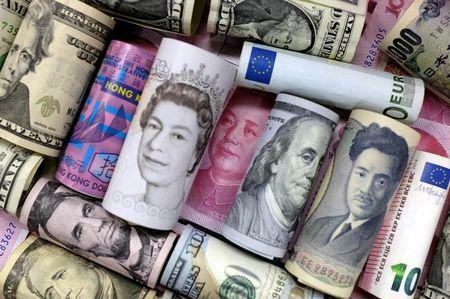 The latest trade skirmishes come as global currency volatility slips back after a February spike off multi-year lows. It remains below levels seen in recent months, according to a Deutsche Bank volatility gauge. "The talk of trade wars at the moment is just that, talk. It's such a difficult thing to quantify it appears as if the market is just ignoring it," said Russell Silberston, a currencies manager at Investec Asset Management, which manages about $140 billion in assets. "But don't get me wrong, we've got it (the prospect of a trade war) down as a key event risk." "I'm still amazed by the lack of a reaction in Asian currencies. They must be waiting for the Chinese retaliation," said Richard Benson, co-head of portfolio investments at Millennium Global, a currency investment manager in London. "There would be quite meaningful moves. We are talking about Asian currencies that are at their strongest for years. There is zero of this (the risk of protectionism) priced in," he said. Benson believes big Asian exporters are most at risk, including the South Korean won and the Taiwanese dollar as well as the Australian dollar - a proxy for Asian economic growth. The won and the Singapore dollar, another currency exposed to global trade flows, are trading near their strongest levels against the dollar in more than three years. Among developed world currencies, Sweden's crown is tipped by some for a tough time - ING strategists point out Sweden is the second-most open economy in the G10 group of rich countries based on a ratio of trade and economic output. Bank of America Merrill Lynch sees the Canadian dollar most at risk, while the U.S. and New Zealand dollars also look vulnerable. The Swiss franc and euro would emerge stronger, they said. While governments often move to protect local industry when growth is struggling, any Trump tariffs will come at a time when the world's biggest economic engines - the United States, Europe and China - are booming. "If there is a trade war, the yen is the safe-haven currency of choice," said Manuel Oliveri, an FX strategist at Credit Agricole. BlackRock, the world's biggest money manager, has studied immediate market reactions around six major trade risk events in the last 15 years and concludes that gold and the yen tend to outperform. In a note, they called a trade war "arguably the most disruptive" market risk for 2018.